KAY STARR BIOGRAPHY Who is Kay Starr? Kay Starr was born Katherine LaVerne Starks in Dougherty, Oklahoma, on July 21, 1922. Her father Harry was a full-blooded Iroquois Indian, and her mother Annie was Irish. When Kay was three the family moved from Dougherty, a town of around four hundred, to Dallas where her father found work installing sprinkler systems in buildings. Because finances were tight during the depression years, Mrs. Starks began raising chickens in a hen house behind their home, and it was here that Kay first began singing at the age of nine. Each day when she returned home from school she would give concerts to the chickens as they sat in their roosts. While her parents found this amusing, Kay’s Aunt Nora recognized the possibilities of her talent and suggested her mother enter her in local radio station WWR-Dallas’ weekly talent contest. After a winning appearance at Dallas’ Melba Theatre singing “Now’s The Time To Fall In Love,” she returned each week winning until the station retired her by giving Kay her own thrice weekly fifteen minute radio program. Earning three dollars a night, and a bundle of fan mail, Kay sang pop tunes and “hillbilly music” until her family moved again to Memphis three months later. Soon after Kay landed her own show, Starr Time, on WREC in Memphis, along with being a featured singer on the stations popular Saturday Night Jamboree program. Know as “The Kid,” the program took requests and whenever a popular song was requested the management would say, “Aw, let the kid to it!” It was also at this time that Katherine Starks changed her name to Kay Starr in the wake of constant misspellings in fan letters. Kay’s first big break came in 1937 when bandleader/violinist Joe Venuti came to Memphis to play the Peabody Hotel. Venuti’s contract specifically required him to have a girl singer with his band – which he did not have. After Venuti’s road manager heard Kay on the radio, both he and Venuti went to her home to discuss hiring her with her parents. So impressed was Venuti, that following their three week engagement at the Peabody Kay went on to sing with the band each summer for the next two years when school let out. Because she was only fifteen at the time Kay’s mother traveled along with her and the band as Kay received a crash course in showmanship and stage presence. In June 1939, in an attempt to further her career, Joe Venuti pitched Kay’s talents to Gil Rodin manager of Bob Crosby’s Orchestra. At the time Crosby needed a female vocalist for his upcoming appearances on the Camel Caravan radio program. Kay got the job and traveled to New York where she made her network radio debut singing “Memphis Blues,” but two weeks later she was replaced by Helen Ward when management decided the program needed a more “seasoned” performer. When her two weeks with the Miller Orchestra were up, Kay and her mother returned to Memphis where Kay finished high school. Following her graduation in 1940, Kay moved to California and returned to work with Joe Venuti. This lasted until 1941 when the general draft call-up for World War II forced Venuti to break up his band. At this time Kay briefly sang with Wingy Manone’s New Orleans Jazz Band until she was hired away by Charlie Barnet late in 1943 to replace Lena Horne. During her time with Charlie Barnet, Kay recorded several V-Discs with the orchestra, which were distributed to the U.S. Armed Forces. In addition to this, she also recorded five sides on the Decca label with Barnet, most notably a bluesy rendition of “Share Croppin’ Blues,” which brought her both critical acclaim and recognition. Unfortunately, Kay’s association with the Barnet Orchestra ended abruptly in 1945 when she caught pneumonia and collapsed during an Army camp show. Upon recovering she realized she had lost her voice, and rather than risk a surgical operation which may have altered her entire singing style, she treated her vocal cords and refrained from speaking – let alone singing – for six months. Following Kay’s professional hiatus, she returned with a deeper and huskier voice that has since become her trademark. Settling in Los Angeles, Kay began her career as a solo performer and had no trouble finding work with the reputation she garnered from her time with Charlie Barnet’s Orchestra. After making a name for herself at Hollywood’s Streets Of Paris and other nightclubs, Kay was invited by Dave Dexter of Capitol Records to sing two songs as part of the labels all-star Volumes of Jazz series in March of 1945. Soon after she went on to make several singles of jazz classics in 1946 for small independent labels like Lamplighter, Standard and Jewell. Following the success of Kay’s work as part of the Volumes of Jazz series, Capitol Records signed her to a contract in 1947. At the time the label was not hurting for female talent, and Kay struggled to find good material that didn’t overlap with others on Capitol’s roster of stars; which at the time included big name talent the likes of Peggy Lee, Ella Mae Morse, Jo Stafford and Margaret Whiting. Still, her first recording for the label, “I’m The Lonesomest Gal In Town,” enjoyed success on the west coast regional Top Thirty Chart, and her cover of Russ Morgan’s “So Tired” became her first top ten hit in January of 1949. Kay’s next success came with her cover of Perry Como’s polka “Hoop-Dee-Doo,” which reached number two on the charts in the spring of 1950. Then while on a hometown visit back in Dougherty, Kay first heard Pee Wee King’s fiddle tune “Bonaparte’s Retreat” and instantly fell in love with the simple melody. After having words written to the tune, Capitol released Kay’s single in April of 1950 and it immediately shot up the charts becoming a near million seller, and Kay’s first major hit. Following the success of “Bonaparte’s Retreat,” Kay recorded several other songs in the country genre, including several successful duets with popular country singer “Tennessee” Ernie Ford. Then on January 17, 1952 Kay was awakened and called into Capitol’s Melrose studios late one night to record a rush release of a new song titled “Wheel Of Fortune.” Kay’s version was released along with two others on competing labels in February of 1952 and it immediately became a huge success. 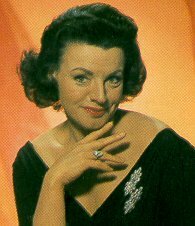 Ultimately becoming the song most associated with Kay Starr and her biggest hit, “Wheel Of Fortune” earned Kay her first gold record and went on to become the number two top selling single of 1952. In the next two years Kay demonstrated her versatility by recording a number of different hits in varying genres. Be it jazz, country, pop, spirituals, Broadway tunes or R&B, she earned the title of “hit maker” recording over two dozen top forty successes between 1948 and 1954. But when her Capitol contract was up for renewal in 1955 she accepted an offer from RCA Records. In Kay’s view Capitol was not making any serious attempts to get her to re-sign, and she also felt that the label was treating her as it’s “utility singer” by the wide gamut of styles and material they had her record. Soon after signing with RCA, Kay again hit the American and British charts in January 1956 with her million selling gold record “The Rock And Roll Waltz.” The single went on to become the number two top selling single of 1956 in the U.S., and the number one single of the year on the U.K. charts. "The Rock And Roll Waltz" also gave Kay the distinction of being the first female vocalist with a top hit in the ‘Rock and Roll’ era. Though she would record several more successful albums and singles, Kay returned again to Capitol in 1959 after being released from her RCA contract. Though often regarded as a "single" artist because most of her material was released on singles, when Kay returned to Capitol the era of the long playing "concept" album was in full force. The "concept" album was pioneered by Frank Sinatra in the mid-1950s, and consisted of an album of songs compiled and arranged around a certain theme, or "concept." During this period Kay would record several such albums starting with Movin’ (1959), an up-tempo jazz album. Considered by many to be the period of her best work, she would record several notable albums like Losers, Weepers…(1960) and I Cry By Night (1962) in the jazz/blues genre, as well as a country album aptly titled Just Plain County (1962). Like many of the great pop vocalists of the 1940s and 1950s, Kay’s popularity began to wane in the 1960s as musical tastes changed with the advent of ‘Rock and Roll.’ After departing from Capitol Records for a second time in 1966, Kay continued touring concert venues in the U.S. and England, along with performing at the Riveria, Sands and Fremont Hotels in Las Vegas, and Harrah’s in Reno, Nevada. She also recorded several jazz and country albums on small independent labels, most notably her 1968 pair-up album with Count Basie, and Back To The Roots (1975) an underrated and overlooked collection of jazz classics. Though Kay has cut back on her appearances since the 1970s in order to devote more time to her family life, she still performs occasionally in nightclubs and concert venues. In the late 1980s she was featured in the revue 3Girls with Helen O’Connell and Margaret Whiting, and in 1993 she toured the United Kingdom as part of Pat Boone’s April Love Tour. Most recently her first "live" album, Live At Freddy's, was released in 1997. Kay Starr has always considered herself a “saloon singer” who told a story with each song, and is critically recognized for the power and emotion of her singing style. Long respected by the jazz community, and considered a favorite and influence by many of yesterday and today’s greats, Kay is truly a gifted and unique performer who has made a success of every musical genre she has tackled. Whether jazz, pop, country or R&B, Kay has done it all and marvelously. With recent compact disc re-issues of her classic albums and singles Kay’s work has seen a resurgence and begun to delight new audiences who are just discovering, or rediscovering, her great talents and style. As for the woman herself, Kay continues to dazzle audiences and critics in her concert appearances, and we look forward to having her do so for many more years to come.